Forty years into his career as The Fall’s only constant, Mark E Smith has given diehard fans many reasons to give up the faith – erratic time-keeping, unengaged performances, onstage fights (perhaps an attraction for some) – with some swearing off the band only to return after a suitable period in limbo. Yet The Fall still command a seemingly unshakeable core cult following, and the Glasgow wing was out in force in a packed, sweaty Oran Mor. Smith chose this occasion to show up bang on time and dressed dapperly to impress, although he did appear to be clutching what looked like the remains of a fish supper wrapper. 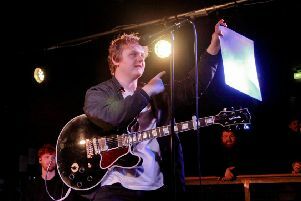 This turned out to be a couple of crumpled lyric sheets which he intermittently consulted, holding at arms’ length and squinting at his stream-of-consciousness invective, or whatever it was he was actually declaiming in his garbled tongue through a fuzzy microphone, all the while looking like a random ranter who had stumbled accidentally into the gig and wouldn’t leave the stage. Fortunately, for all concerned, The Fall (mk.43, but who’s counting?) were on feisty form, fashioning taut drums, heavy bass, and squealing distorted keyboards into a relentless assault as disciplined as their leader appeared awry. Given the regularity with which Smith hires and fires yet consistently achieves the Fall sound, it is clear who is in charge even if it often seemed as if the band were merely indulging him. As is The Fall way, most of what anyone might want to hear from their extensive back catalogue was ignored in favour of a brace of tracks from the latest album. Fortunately, Sub-Lingual Tablet, the album in question at this point in proceedings, translated powerfully and the set as a whole was marked by a rigorous muscularity. There were diversions into deep juddering funk, the bassist finger racing across the strings and a bit of fidgety funtime Fall before a hunkering down for the home run, propelled by urgent clanging guitar and insistent Krautrock rhythms, which gradually and relentlessly turned up the heat, while also threatening to fall apart thanks to Smith’s habitual interference with the equipment. That left just enough time before curfew to throw the crowd a bone in the form of punky rock’n’roll shoutalong White Lightning. Same old Fall. In a good way.